Photographs are taken by your digital camera or scanned by your photo processor to be big enough to print. You then need to change them to be the right size to post on the web. It is very important that you SAVE the original. Files that are the right size to email or post of the web will not make good prints. Download your digital camera OR have your film processed and get a CD made. If you are using a digital camera, backup the images in a safe place (removable hard drive or CD or DVD). Store this in a safe place. Now open the images, choose the ones you want to share in Flickr or Etudes and resize them for the web. For Flickr you can use many sizes, but the size I recommend for Etudes is 600 to 800 pixels in the longest direction at 72 ppi. Save the new image with a new name so you don’t lose your larger original images. EXAMPLE: File DSC0995.jpg opens. I resize it. I save it as DSC0995web.jpg. I now have the original to print and the web image to post or email. How you resize depends on your software. I will review a few steps here. Likely your software will have a similar process. Use the help files, look around and you will figure it out! 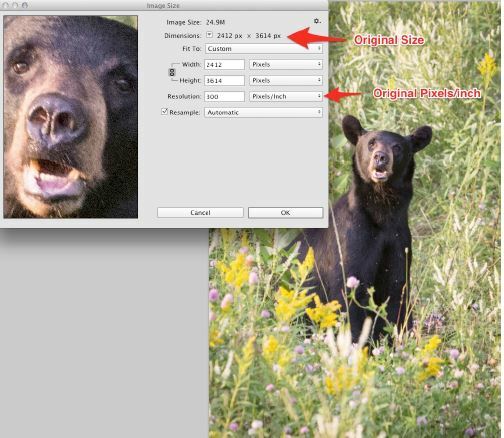 In Photoshop you will go to Image:Image Size and click off the “resample image” button. Now change the resolution to 72 ppi. Then click “resample image: button on again and change the size of the image to 600 pixels in the longest direction. Now save with a new name. This will now be ok to email and upload to Etudes or other online service. 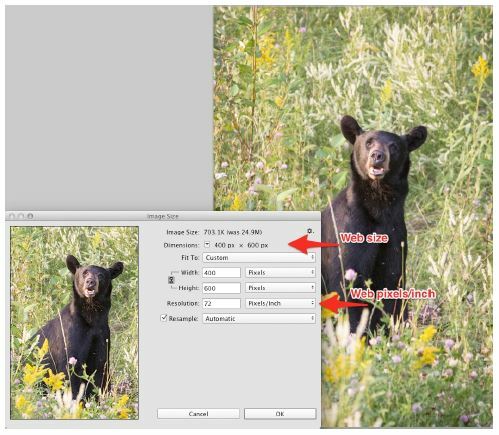 Find “Resize” then choose image size and go through the same procedure as Photoshop CS. You can export your images from iPhoto to the size you need. Again, make sure that you rename the file. You can also size the photo for a medium email. (Go to share:email and choose medium.) It will open in your email program and you can save it out of there. It will then be the right size to post on Etudes. The software that came with your camera should have a resizing option. Using the recommendations above and the help files, you should be able to get your photographs the right size with some trial and error. Picassa also has a great face recognition feature. Choose the photo then export with a new name in the size you need for web use. There is also resizing in Flicker – but that would be after you uploaded the photograph from your 12 megapixel camera. It is a way to get a smaller image if you need it and are not using the above programs. From my camera, my photographs are 3.88 MB and 2832 x 4256 pox. This is MUCH bigger than I need for Flickr and too big for Etudes.The upload time will be long and the chance for errors during upload increase. Resize to a web size and save that original on hard drive or a cd or a DVD to print in the future. WEBSIZE is small – 400-800 pixels on the longest side. PRINTSIZE is large – a minimum of 1200 pixels on the longest side. 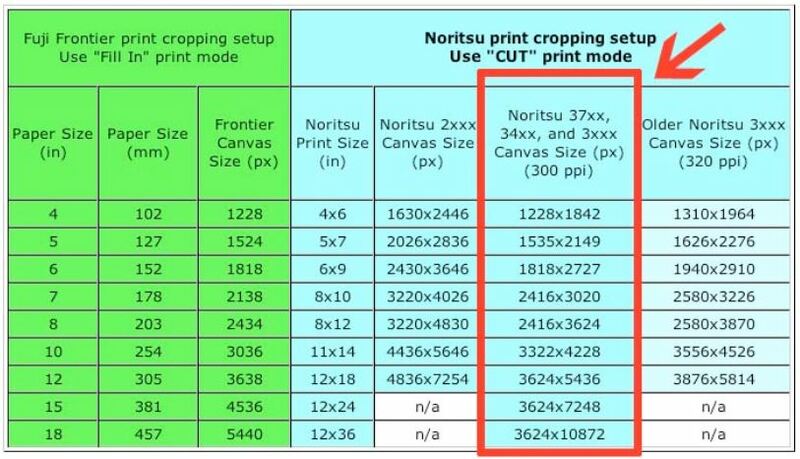 Below are the preferred sizes for printing to Costco (Sizes I use are in the red box.) You can quickly see how different an emailed photograph is from a printed photograph!